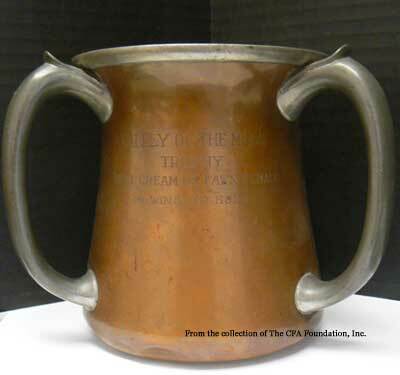 Engraved on front, "Valley of the Moon Trophy, Best Cream of Fawn Female, 4 Wins to Hold"
Engraved "For Best Cream or Fawn Female, 4 Wins To Hold"
Photos: Karen Lawrence, courtesy of The CFA Foundation, Inc.
Not much is known about this 3-handled trophy, recently donated to the CFA Foundation. The pewter and copper trophy is engraved "VALLEY OF THE MOON TROPHY", which may well mean that the trophy was donated by Valley of the Moon Cattery. Trophies donated by individuals and catteries was a fairly common occurrence at shows held in the early 20th century. Linechaser records show 30+ Persians registered in the early-mid 1920's with the Valley of the Moon cattery name, which enables us to approximately date the trophy. Registration records found in Volume XIII of the Studbook of the American Cat Association show Mrs. M.G. Simmons of Sonoma, CA to be the breeder of cats with the "Valley of the Moon" cattery prefix. Volume X of The Studbook and Register of the Cat Fanciers' Association lists several cats with the "Valley of the Moon" prefix; all listed with Mrs. Simmons as the owner, but not the breeder. One listing has Mrs. Lina Mooney as the breeder, and another has the breeder as Mrs. Fred Rippel. Note that it was not uncommon to add your cattery prefix, in this case "Valley of the Moon", to the name of cats when ownership was transferred. The 5" high trophy is also engraved "Best Cream or Fawn Female. 4 Wins to Hold". As the majority of Valley of the Moon Persians were registered with the American Cat Association(ACA), this is most likely a trophy awarded at ACA shows.